“We are all visionaries, and what we see is our soul in things,” wrote Henri Amiel in his journal. The psyche presents itself most directly through images. The world we look at is like a cabinet of curiosities: the collection my eyes see is different to what your eyes see. 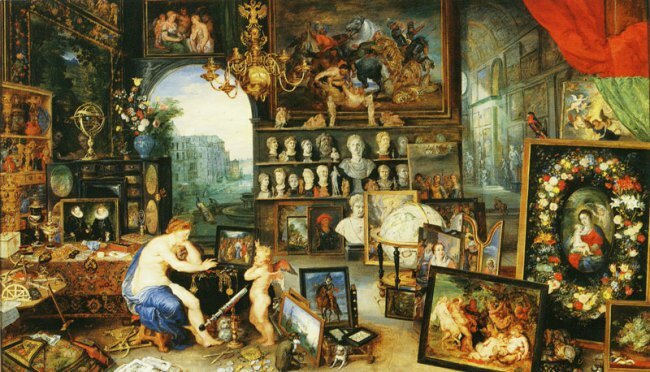 I love the wonderful plethora of objects huddled in this painting: looking at it, I feel dizzy but also excited about discovering an unclassified world of wonders. I believe the true seeing comes from within and what we see reflects the degree of our attunement with the soul. In an extraordinary novel by Jose Saramago called Blindness, the inhabitants of the whole city, except for one woman, become blind. She becomes the soul of the book, the only one who able to see, nurture others and save them. i’d just to think about Shamanism!! Amelia B. Edwards – A Thousand Miles up the Nile.